As soon as Monday, Dec. 10, riders may see a test RapidRide bus traveling the C/D lines between Ballard, downtown Seattle, and West Seattle. Instead of stopping to pick up riders, the bus will travel the corridor with Metro staff members aboard to compare actual bus arrival times with what the real-time information signs say. We’ll collect data for a few days and analyze it as part of our ongoing effort to improve the performance and accuracy of real-time bus arrival signs at RapidRide stops. Behind the scenes, we continue to troubleshoot the software, hardware, and communications that feed the signs – a dynamic system that tracks buses, reports their locations, and predicts and reports when they’ll arrive at upcoming stops. 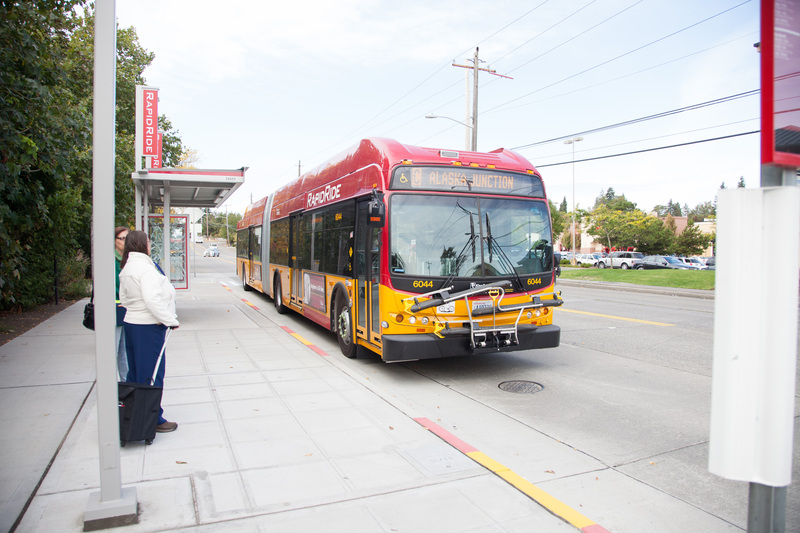 This key feature is integral to RapidRide service, something riders remind us of daily – especially when traffic congestion delays our otherwise frequent service. We’re working on improving the system with the goal of providing good information more consistently. “So if someone pays cash and doesn’t accept a transfer evidently they are a criminal” good point @Dean Anast! I have watched and participated in the route changes with deep dismay, and my greatest disappointment has been with Rapid Ride. But I grudgingly accept what a group of non bus riding bureaucrats have decided to dictate to the public because these elites have made the changes irreversible. So, reconciled to the changes, I got on a rapid ride to Ballard yesterday when I was approached by a gentlemen in black asking for proof of fare payment. What is this? Am I in Nazi Germany with the SS demanding “papers”? He was polite; and I suspended my constitutional rights and gave over my faux Third Reich issued identity card. Satisfied, the benevolent Gestapo moved on to their next target, a little old lady. So if someone pays cash and doesn’t accept a transfer evidently they are a criminal I noted. And everybody suffers indignities because a totalitarian system must weed out broke alcoholics or street people. But I will accept this; after all, we must understand that everyone must march in step and not go up the down staircase. I suggest that the enforcement gentlemen wear pink uniforms so they will not frighten the elderly into convulsions and strokes. Earlier this week, I got to read the rider notice sign at the 3rd & Virginia southbound Rapid Ride stop telling me that the timing issues for the signs at the stop were being analyzed. Of course, the stop has no such sign… This is particularly vexing, since OneBusAway on my phone still doesn’t work correctly for the C line after over two months. Thus, I have absolutely no clue about when the next bus will show up. Or, as has been the case on a couple of occasions, when the next two buses will show up simultaneously after I have waited for almost half an hour. I appreciate the efforts to fix these problems, since my evening commute has gone from a highly reliable, well-timed sequence of events to a random roll of the dice.